Nature fun idea No. 6 on our Countdown to Christmas list was to create twig stars. The task began by collecting sticks at a Christmas tree lot we visited with The Little Explorer’s preschool. Unlike most sticks in our neighborhood, these were fresh cut and smelled amazing! Choose 5 sticks & lay out the design of your star. If you use a glue gun to make your twig stars, the process will go pretty fast. Without one, it took us a little longer – which was a good thing. It gave us a chance to slow down and connect. We talked about which sticks to use and what other shapes we might want to make. Then The Big Explorer held the sticks in place while I secured them with twine. Once our twig stars were ready, we added bits of holiday nature décor. It was truly a team effort. Enjoy the collecting – it’s fun trying to find just the right sticks! 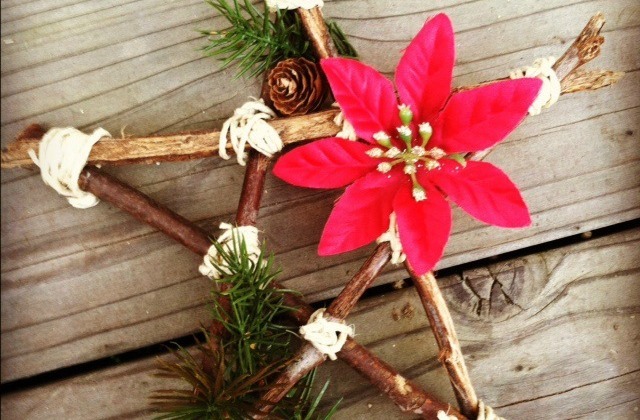 Leave the actual forming of the twig star (whether by glue or twine) to an adult – unless you have older kids. 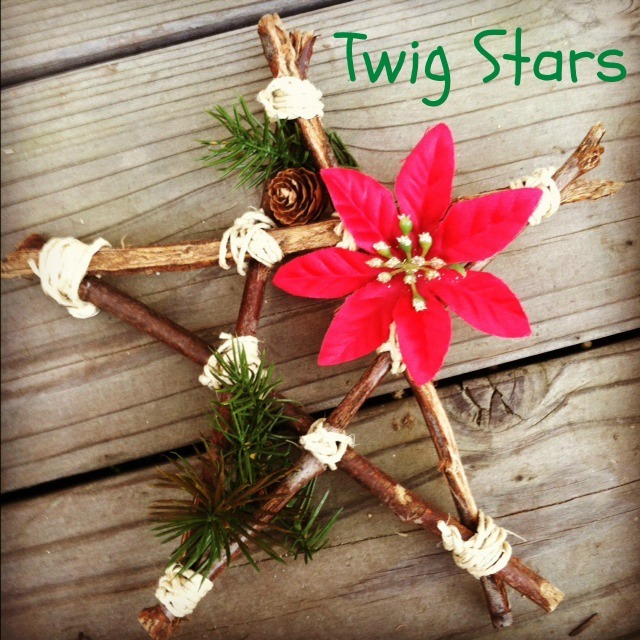 Younger kids will enjoy adding other items to the twig star once it’s formed. Add paint or glitter as desired for some extra pizzazz. I am happy to report that the very first item to be placed on our Christmas tree this year was our twig star. I think these would be fun to do for the 4th of July. And they&#39;d be nice to have in the garden dressed up in bright colors of yarn all year. Hmmm…I meant to do this, but didn&#39;t get around to it. I suppose it&#39;s not strictly a Christmas thing. Those stars would look good all season long. Wow – thanks so much Joy! What an honor. I&#39;m off to go check out your post. Happy nature crafting! Thank you, Hannah! Our Countdown to Christmas has really helped these first days of December feel less hectic. Glad to hear you&#39;re getting outside a lot, too! Happy holidays! Hi Barb! Hope you guys are able to try this one, too. If not now, maybe come spring or summer. These would be great for Fourth of July. I love it. What a great idea. And the tree farm as twig supplier is fantastic since I wasn&#39;t sure where we would start now that most of the landscape around us is covered in snow. Thanks for a great looking project! Bookmarking this one!